You’ve probably slept on a couch bed before. You’ve almost certainly at least seen a sleeper sofa in Vancouver before. 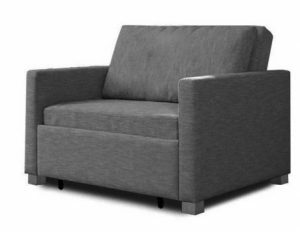 And the sleeper sofas in Vancouver you’ve seen probably all look very similar: A boxy couch with a terrible pattern and a metal frame that pulls out to hold a thin mattress. The bed is hard to pull out, and the design doesn’t make for a very good night’s sleep. Sofa bed designs have been updated a bit, thankfully. You have a nice range of options so you can get just the look you want in a sofa bed, as well as easy functionality and comfort. Understanding sofa bed designs can help you orient yourself in your search for the right sleeper sofa in Vancouver for your home. The biggest problem with the couch beds of old was how difficult it was to pull out the bed. The metal could get caught on sheets or the fabric of the couch, or the hinges could become difficult to move with years of corrosion. Today’s sofa beds in Vancouver have avoided this problem by opting for an easier mechanism design entirely. You will see a few different options when you shop for new sofa sleepers. One is exemplified in the Harmony sofa beds from Expand Furniture. These beds have a “footer” that pulls out like a recliner, revealing a bunky board for the mattress. Push the seat back down and you see that the cushion is actually the mattress folded in on itself. Just open the mattress out like a brochure and lay it flat on the bunky board and the seat back. Another mechanism you’ll see in modern sleeper sofas is what you find in a futon. The sofa looks like any other sofa, but the seat back reclines completely, and the back and seat become one flat sleeping surface. Most sofa bed manufacturers have left innerspring mattresses in the past. These mattresses don’t stand the test of time very well, so they often become like thin pieces of cotton over some lumpy springs. They don’t offer very much support and they aren’t very comfortable. If you see a sofa sleeper with an innerspring mattress, be cautious. Memory foam mattresses are the more common option, and they are the better choice. These mattresses have a high-density foam that seems to wrap around your body like a glove. It settles around every curve and every nook of your body. 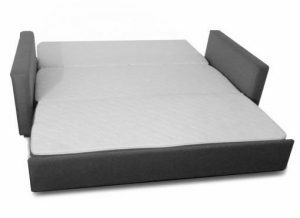 The result is a seemingly weightless sleep – you’re supported in just the right places and comforted everywhere. A memory foam mattress won’t compress over time, and you won’t feel any metal bars or beams in your back while you sleep. Modern sofa beds look just like any chic sofa you would have in your living room. For the most part, they have minimalist designs with clean lines and simple yet high-quality fabrics. These are sofas that will look stylish in your living room, yet they are modest enough that they can fit in with any other furniture or décor you have with minimal effort. By shopping with a retailer like Expand Furniture, you also get the option to customize your sleeper sofa such as with a different fabric color. You’ll be able to get just the look you want. You can even mix and match pieces like memory foam twin sofa beds with memory foam king sofa beds, making a nice seating area, as well as creating the maximum amount of sleeping space for your family or guests. It’s important that you prioritize the elements you need in a sofa bed so that you can focus on the designs that best suit your needs. There are many sofa beds available, so focusing your search will help you find the right sleeper sofa faster. Expand Furniture sells the highest-quality modern sofa beds in a variety of sizes. We have everything from twin sofa beds to king sofa beds. All our sofa beds feature a modern aesthetic that fits in nicely with luxury homes. The minimalist design is versatile enough to fit in even with a rustic aesthetic. Shop our online selection to see our gorgeous sofa beds for yourself and to find the right sleeper for your home.